Stainless steel, carbon steel and low alloy steel for use in industries spanning construction, marine, automotive, and domestic appliances to name but a few have all been produced by Acewell. From our purpose built fabrication facility to tried and tested production line, Acewell has the expertise and experience to produce investment casting products to the highest standards and requirements. 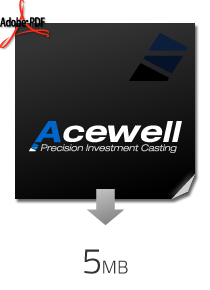 From tooling design, fabrication and testing all the way to turn key cast parts, Acewell has it covered.